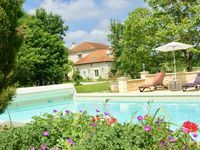 Property 3: Mill 14 ° century, near St Emilion, Bordeaux Arcachon, Dordogne. Property 42: Pool, Wine and wonderful views. Beautiful house 170 m2, indoor heated pool, jacuzzi, classified 4 stars. Property 49: Beautiful house 170 m2, indoor heated pool, jacuzzi, classified 4 stars. My husband and I spent 3 nights in this cottage. Christine was a good host. She replied to all my emails and questions very promptly. She also suggested some things for us to do. She could not be there when we arrived. But her son did a good job receiving us and showing us around. The cottage is quite roomy for a couple and very clean. There is a second bedroom in the loft. But the entrance is a little funky through beams. The outdoor space is very nice with trees and bushes. A good place to spend an evening with a bottle of wine. Christine had left us a bottle of wine from her vineyard and it was very good. Overall we had a very nice time in the cottage. I would highly recommend going to the Libourne Sunday market (suggested by Christine).